According to IEEE Spectrum, Python is ranked No. 1 in the top programming languages of 2017. Python has continued its upward trajectory from last year and jumped two places to the No. 1 in the overall ranking. While the first position is confirmed for Web and Enterprise categories, this amazing language still needs to explode in the Embedded category, despite the rise of Python-based embedded development platforms like Zerynth and MicroPython. if you replace C with “assembly” in that statement, you’d have exactly what an extinct generation of programmers said about 20 years ago! — Perhaps, more importantly, it will be more “writeable” (this is an oft-overlooked quality!). So, while C/C++ is slow to write, error prone, and often unreadable, Python is known for its writability, error reduction, and readability. For these and other reasons, according to one recent study, Python isn’t just the most-popular language for introductory CS programs and hobbyist developers, it’s also the fastest-growing language for embedded computing. There’s an enormous crowd of professionals skilled in using Python “potentially” able to develop the software for the “next big thing” in IoT and to ship new amazing embedded applications in a short time. Zerynth reaches beyond professional embedded developers to also offer high-level programmers, product designers, and IoT developers a complete set of high-quality embedded development tools to create interactive and connected solutions. Zerynth allows designing embedded applications and IoT connected devices using any 32-bit microcontroller and connecting to any cloud infrastructure. All in Python and hybrid C/Python language. One word: simplicity! Unlike other Python implementations for microcontrollers, with Zerynth there’s no need to copy/paste creepy scripts from different web sources. No need to drag-and-drop any file in any folder or via FTP. No need to install Python on your PC and no need to install Putty or special drivers. Thanks to Zerynth, you can make your device programmable in Python with just a few clicks! That’s it. Following these very simple steps, you can program your device in Python instead of having to use complex low-level languages like C or C++. This is an excellent choice for beginners who are new to programming. For advanced users, Zerynth allows mixing Python and C code in the same project. This kind of “hybrid” programming is extremely powerful in scenarios where the project needs low-level code for time critical tasks while keeping Python flexibility and readability for non-time critical sections. With Zerynth you haven’t to choose between development speed and runtime speed. You can have both! Find out more about the Zerynth-C language interface in the official doc. Zerynth Virtual Machine, the core element of the Zerynth stack provides a real hardware abstraction layer allowing code reuse on a wide range of 32-bit microcontrollers, the heart of embedded and IoT solutions. The Zerynth Virtual Machine has been developed with the goal of making Python usable in the Embedded world. To do so some features of Python have been discarded because they were too resource intensive, while non-Python features have been introduced because they were more functional in the embedded setting. Take a look at the official doc to see a (not-comprehensive) list of the differences between Zerynth and Python. Unlike other IoT development platforms, Zerynth provides a complete “ecosystem” of tools that allow you to go from the firmware development to the cloud connection, thanks to an extensive collection of libraries. how to use Zerynth to program in Python for Nordic’s nRF52832, a Bluetooth 5-ready SoC supporting Bluetooth Low Energy (BLE). 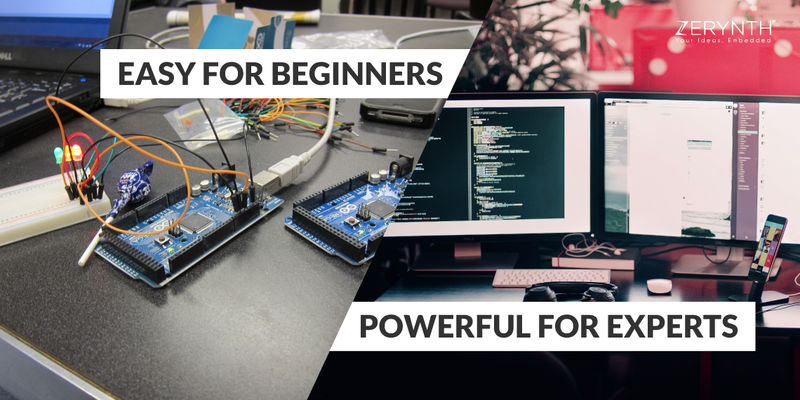 As mentioned above, students and hobbyist migrating into the industry with experience programming in Python for drones, robots, or other projects frequently have a Raspberry Pi or an Arduino background. All this, with a relatively tiny footprint of 60k-80k of flash, 3-5k ram. Zerynth is already used by companies and professional teams to build amazing IoT and embedded solutions in different sectors: retail, commercial refrigeration, waste management, smart devices and much more, as you can see in the “Built with Zerynth” wall. Now that you know all the advantages of embedded development in Python it’s time to download Zerynth Studio and start your dream project. After all, it’s free, it’s easy, and tailored to your needs.